The first Eurobowl game on Swedish soil since 2003: Finally it was time for the first game of the season. 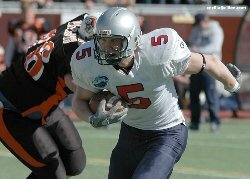 Moscow Patriots came to Stockholm to play the first game in division 2 in this year Eurobowl. A renovated stadium, good weather and a big crowd made up all the ingredients for a great game. Stockholm, April 23: rd, Zinkensdamms IP. drive. There was no question this was the first game of the season for both of the teams. Moscow to either run with Chekov or pass to Sigaev. didn’t have anything offensively in the first quarter. could run in for a 35 yard touchdown. The Moscow offense continued to struggle with a well playing Mean Machines defense in the second quarter. The defense was swarming to the ball and did not give up anything through the air. Moscow has always been able to produce points against all their opponents in European play, but not this day. The Mean Machines offense ate up most of the second quarter with a 16 play, 86 yard touchdown drive. Casey Paus dove in for the score from the Moscow 1 yard line after 5 different guys helped move the ball during the drive. After that the teams traded punts and ent to half time Mean Machines up 14-0.
caught the ball in the end zone for his second score of the day. Two scores in less than two minutes finished the game, 28-0. The rest of the game was sloppy from both sides. 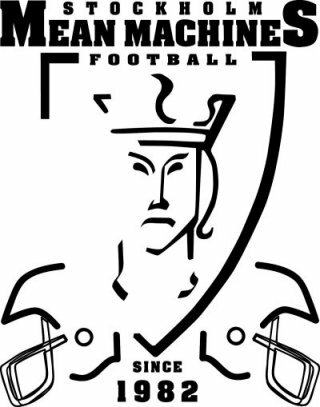 Mean Machines offense got a last score on a pass from Paus to Henrik Hegardt but other than that the teams traded punts. The Stockholm defense played solid and it was never really threaten. An interception by Rachid Belkacem, his second, ended any last hopes Moscow had on getting a consolation score at the end of the game. LB’s Ola Rugeand and Martin Kwarnmark played a solid game, Safety Petter Ehrnvall and Cornerback Rachid Belkacem where all over the field and the latter had two picks for 17 yards. On offense WR Kim Fye had a great game with 11 catches for 107 yards and 2 TDs and Casey Paus were 22-39 for 196 yards and 3 scores. Starting WR Kim Fye not only played his first game with the senior team, he also started and was the leading WR at the end of the game. Over all this was a great day with a crowd of 1227 and great weather this early in the season. The next game for Stockholm will be May 13 in Seinäjoki, with an opportunity to advance to the semi-final.